What is the function of management? I often ask. In organizations, we design roles for people to play. So, what is the role of management? Every employee is entitled to have a competent manager, with the time span capability to bring value to their problem solving and decision making. I once asked the definition of an entrepreneur. I was sternly instructed that an entrepreneur is that person who creates an organization that leverages the skills and talents of other people to create something that no one individual could produce on their own. And, so it is with a manager. That person who leverages the skills and talents of other people to create something that no one individual could produce on their own. Individual achievement is a myth. The truly great works of mankind are nestled in the collective works of people transformed from a group to a team. Sustained achievement is the collective work of people, transformed from a team to an organization, that continues to create beyond the original ideas of the founder. 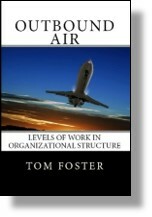 This entry was posted in Organization Structure and tagged Organizational longevity, sustained achievement on October 5, 2018 by Tom Foster. I think another function of management is to provide the members of the team with the “tools” that the members need to complete their tasks. Those tools can take many forms but it is also incumbant upon the members to know what tools they need do their tasks that keep the process moving. Is there a difference between the terms management and operations?